This extremely easy tilapia recipe was a hit in the cafe this week and many of you asked that I share the recipe. The photo doesn’t show the sauce on the fish, because I’m using a photo from blackened tilapia. You can serve it without the sauce, but as many of you commented, the sauce is divine! 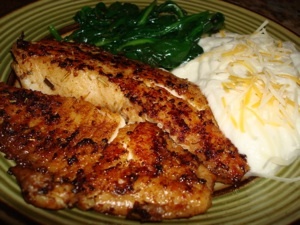 Coat tilapia fillets with 2 tsp olive oil. Mix 1 tbsp Cajun seasoning, salt and 1 tsp garlic powder and rub all over both sides of the fish. Grill fish on 450F hot outdoor grill for 4 minutes per side. Remove from heat and cover with foil. In a medium pan, saute mushrooms and pepper in 1 tbsp olive oil until tender. Deglaze the pan with the wine, scraping up all the burnt, flavorful bits from the bottom of the pan, and cook until almost totally dry. Remove pan from the heat, season with 1 tsp garlic powder and 1 tsp Cajun seasoning. Add the butter and swirl the pan around until the butter melts. Add the cream, return pan to the heat until it just begins to bubble. Remove from heat, serve sauce over fish. Garnish with fresh cilantro. This entry was posted in Entree and tagged blackened tilapia, Cajun, creole, mushroom cream sauce, new orleans, tilapia by quarlj01. Bookmark the permalink.